Last year I was lucky enough to be featured in a chapter of the 2009 edition of Andy Kilpatrick’s book “Of Permanent Value: The Story of Warren Buffett.” I was in chapter 205, page 1169-70. 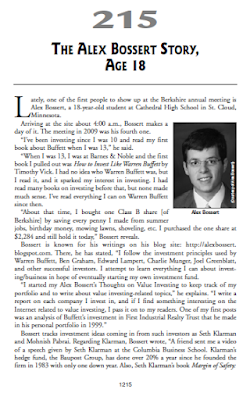 The chapter was titled “The Story Of Alex Bossert, Age 17.” Andy Kilpatrick is good friends with Warren Buffett and has been updating the book every year. The book is sold directly at the annual meeting every year. Next year’s edition will be out in April and has a chapter on me and my friend Eric Schleien. Chapter 215 is titled: “The Alex Bossert Story, Age 18.” The chapter is on page 1215. “Of Permanent Value” is considered by many to be the most extensive book about Warren Buffett and value investing.